One of the major problems in Niger is giving the underprivileged rural populations access to water to improve their living conditions. In this context, solar energy, widely available in Sahel countries, can be efficiently used for solar PV direct drive pumping systems. These systems fulfill their basic needs, withstand the harsh conditions and constraints of isolated sites and provide drinkable water that would otherwise be too difficult and costly to transport. The programme to supply drinking water on a small scale via photovoltaic systems (PMAEPS), funded by the European Union, was set up in 108 areas including villages and small towns in Tahoua and Maradi in the center and the south of the country. The project benefits 270,000 people, almost 2% of Niger’s population. 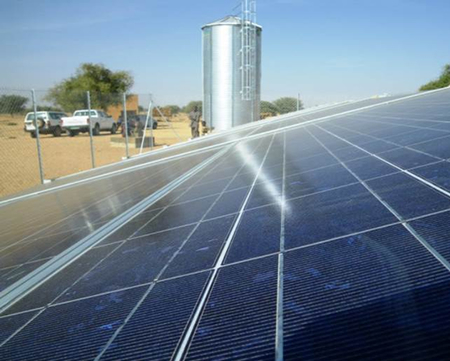 Given the high number of installations and services involved in the project, the PMAEPS programme is the largest solar pumping project to date in West Africa. PHOTALIA’s patented Universal Pumping Inverter (UPI) is the cornerstone of the project – extremely robust and highly reliable, the UPI converts and feeds the energy collected by the PV array to the submersible pump. It is also the system controller collecting information from the PV array, the pump, the water levels in the borehole and the water tower, ensuring the system’s reliability and performance. It is designed and engineered to work in very basic system configurations, for example using solar as the sole source of energy, making the use of batteries redundant, adding cost effectiveness to the solution. The project involved group of companies including Apex BP Solar and Vergnet Hydro’s Franzetti who won the project under the impetus of PHOTALIA and was responsible for engineering of the systems and the global project coordination on behalf of the group. It took 29 months and a team of 300 to complete the project at a total global cost of €7,895,000, with PHOTALIA services totalling €1,031,000. Vergnet was proud to be part of this project which is now consistently delivering drinking water to over 270,000 people across Niger. The innovative design has resulted in the largest solar pumping project to date in West Africa, and highlights the importance of continuously producing state-of-the-art technology to uncover renewable solutions. Vergnet is committed to developing the most technologically advanced renewable energy solutions and this project demonstrates how a readily available resource such as solar energy, can be effectively utilised to meet the needs of isolated sites. PHOTALIA was created by the VERGNET GROUP to add a solar PV business for isolated sites which would share the Group’s values of involvement in and respect for the environment. PHOTALIA is committed to sustainable development as it proposes practical solutions to meet the vital needs in water and energy. PHOTALIA, VERGNET’s subsidiary, is specialised in photovoltaic solutions for water pumping, electro-chlorination, off- grid and hybrid power solutions for commercial and industrial applications. PHOTALIA was created in 2007 by a specialized team experienced in photovoltaic applications. PHOTALIA covers a large range of activities including solar pumping, commercial and industrial off-grid and hybrid applications in the most difficult regions, proving its technical and logistical capabilities. The team responds appropriately with effective management and respecting contractual obligations. PHOTALIA proposes solutions which have been specially conceived for the constraints of isolated sites and zones in needs of electricity. The strength of PHOTALIA lies in the 12 year long experience of its staff, knowledge of the field and knowledge of the products. PHOTALIA is already present in over 20 countries through its strong technical and commercial partnerships covering a wide geographic area.